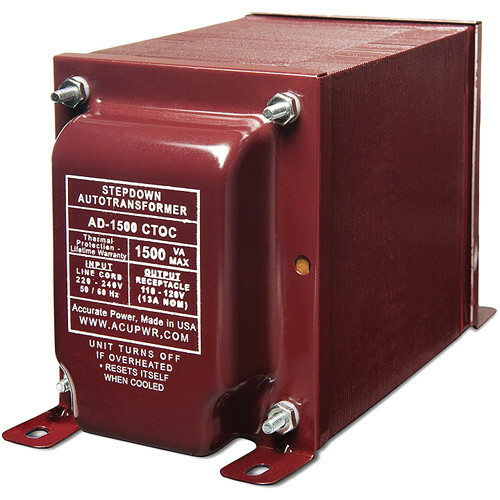 The 1500W ACUPWR AD-1500 Step-Down Transformer is designed to let you use 110-120 VAC appliances in countries with an input source of 220-240 VAC. It offers risk-free operation to ensure the safety of your gadgets and appliances abroad. Made from high grade copper metal, the transformer is durable and reliable. Instead of "playing it safe" by purchasing a transformer 2 or 3 times the power you need, this transformer features Tru-Watts technology that allows it to perform at its stated wattage and operate at 120% beyond its stated power if necessary. Finally, a Thermal Protection circuit is used instead of fuses causing the unit to shut down when it detects excessive heat and restart when it returns to normal operating temperature. Box Dimensions (LxWxH) 11.0 x 8.25 x 6.75"
How do I know what wattage to get? The right wattage for you would be based on the wattage of the device that is plugging into the transformer. How do I know what wattage I need? Safe guideline is to get a unit that has about double the amount of wattage you will actually use. This helps prevent overloading and increases the units lifespan.